There are 6 Memory Care Facilities in the Waterford area, with 1 in Waterford and 5 nearby. The average cost of memory care in Waterford is $7,200 per month. This is higher than the national median of $4,650. Cheaper nearby regions include Glastonbury with an average starting cost of $5,795. To help you with your search, browse the 4 reviews below for memory care facilities in Waterford. Better rated regions include Glastonbury with an average rating of 4.0 out of 5 stars. In a state where 75,000 seniors have been diagnosed with Alzheimer's disease, communities across Connecticut are seeing a growing need to provide specialized care options people with some form of dementia. The town of Waterford has a population of just over 19,000, 22.4 percent of whom are 65 years of age and older and a portion of them need memory care support. There is one memory care facility in the town and an additional seven facilities in nearby communities. These facilities are known as Alzheimer's Special Care Units (SCUs) in Connecticut and are required to have a special license from the state's Department of Public Health to operate. While higher than the U.S. national average of 100, Waterford's cost of living scores a 113.5, which is lower than the state average of 118. This may make Waterford an attractive option for seniors and families looking to save money to put toward the cost of a memory care facility. Compared to both state-wide and national averages, the rate of crime in Waterford is higher. On a scale of 1 to 100, with 100 being high crime, violent crime in Waterford scored a 41.2 and property crime received a 31.1. Most SCUs are equipped with surveillance cameras and have security systems, but it's still a good idea to ask about a facility's specific safety policies and procedures. Located in the New London County, Waterford is home to world-class medical facilities, including those specializing in brain health and dementia care, such as New London's Lawrence + Memorial Hospital, in the event of medical emergencies or illness. Like much of Connecticut, Waterford experiences harsh winters. Temperatures can drop below 20 degrees, and an average of 27 inches of snow is expected to fall each year. Consider looking into the policies an individual memory care facility has in place to ensure its senior residents are safe during the cold winter months. Memory Care costs in Waterford start around $7,200 per month on average, while the nationwide average cost of memory care is $4,778 per month. To see a list of free memory care resources in Waterford, please visit our Assisted Living in Connecticut page. 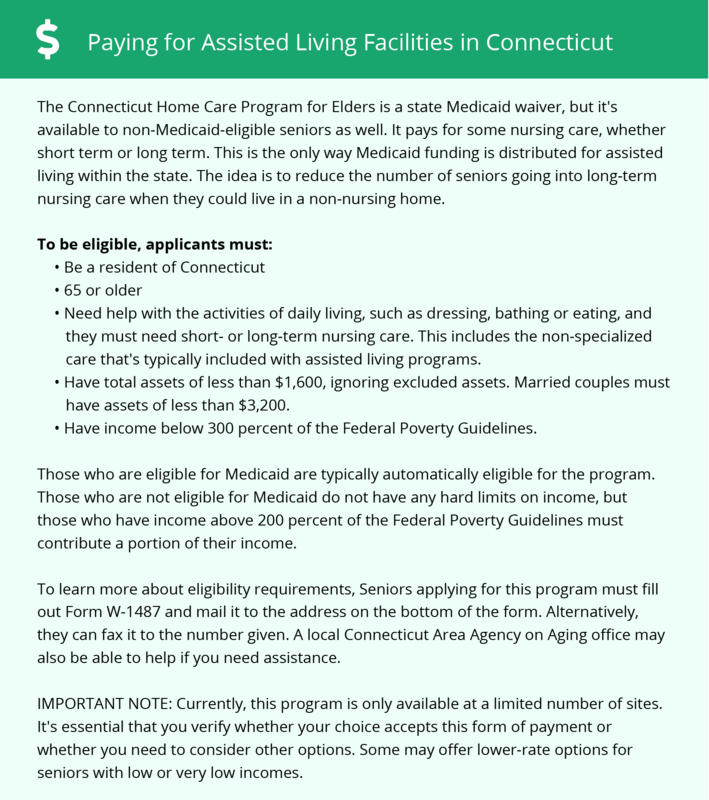 Waterford-area assisted living communities must adhere to the comprehensive set of state laws and regulations that all assisted living communities in Connecticut are required to follow. Visit our Memory Care in Connecticut page for more information about these laws.